Well in the middle of the series the bears took an absolutely invincible lead over bulls. The larger trend for the month of August was UP with the stellar opening at 8450+ levels with an 800 points fall from there. There are multiple factors that are being touted China, crash etc etc etc. Corrections are healthy for the market and the longer term uptrend is intact. Whilst a close above 8400 levels for the month of August would have been more helpful, I personally would read this as a false breakdown. Things should turn for the better at the end of September towards Diwali 2015. The only point I would mention is that the breach of 7700 twice with conviction implies that a deeper correction is likely in the next 6 weeks. However, as long as the 7200-7440 band is intact, bulls have nothing to worry. 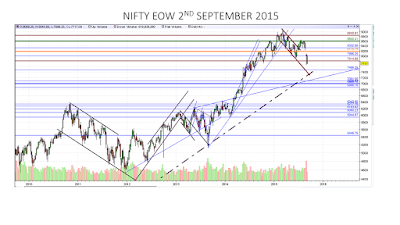 The minimum upside target for Diwali 2015 is about 8600 or perhaps even higher. As we can see in the Nifty Weekly charts, even in the severest correction, the long-term trendline has not been breached [currently between the 7200-7400 zone] and likewise for BankNifty [15500-16000] band. So we are almost there in terms of corrective phase. However, corrections have price, volume and time factors. This instance the price and volume factors have been high, whilst time has been short. 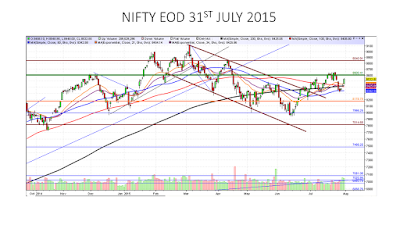 Falls in the current situation are great for buying on delivery basis, especially commodity linked stock prices. No matter how much the media pundits talk about the China factor, it has completed its boom and bust cycle within a 9 months. As far as base metals are concerned, there is enough inventory for about 12-15 months [the norm is 18-24 months inventory] and the dollar index is on the verge of peaking. 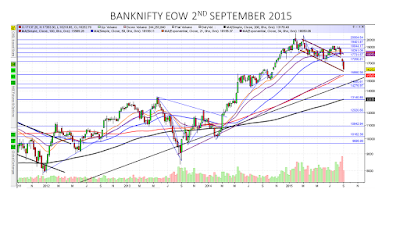 It had a rally from 75 to 99 and a logical technical retracement would be about 85-87 levels. The way commodity prices are shrinking, one has to wonder how much more will they have to fall? As it is prices have gone below costs for a lot of plants. The industry has been through multiple peaks and troughs. A lot of plants will be in cold-idle stage until there is a reasonable recovery in commodity prices. The US rate hike will be perhaps deferred for some more time till there is clarity on liquidity situations. On the global front, I had mentioned earlier that there is a very strong correlation between the 3rd year-2nd consecutive term of a US president and global liquidity conditions [on the downside], as of now, the basic tenets have been entrenched. A relief rally towards Christmas is more likely as the risk reward ratio has tilted favorable for bulls over the last 4 weeks. A larger crisis is waiting to explode but that should happen about a year down the line closer to October 2016. The longer term charts clearly show that the bull market conditions are in place. The longer term [3 to 5 years] targets are 9600 followed by 10200. However, such large scale movements take place closer to election years as outlined in the interim post. A close examination of Nifty post-2001 shows that markets open with significant gap-ups in the month of May of an election year followed by double zig-zag corrections. How can we be sure that we are in a corrective phase?? Housing inventories are piling up despite reducing interest rates and clear indications of higher rate cuts. There is an elevated level of advertisements in media for mutual funds and ULIPs that usually come towards market tops [albeit interim]. The only heartening fact is that this time, there are multiple prudent people advising SIPs and that is good. SIP is always a good route regardless of bull or bear phase. 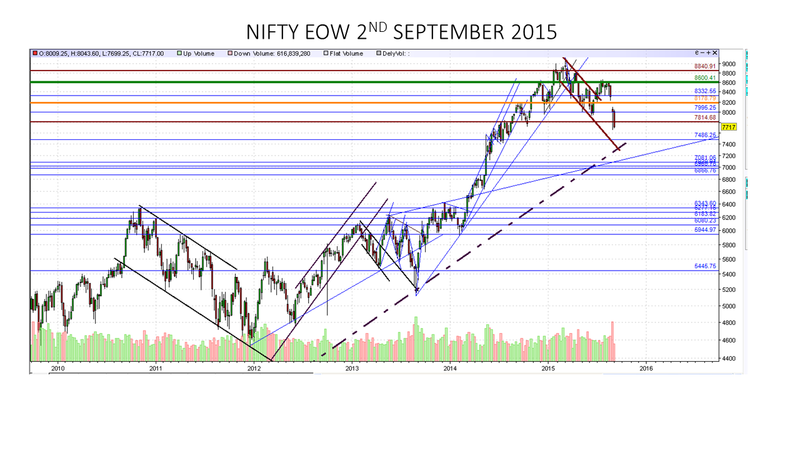 Bearish Phase: Correction is still pending and the indices will head lower to the support lines shown in the graph. 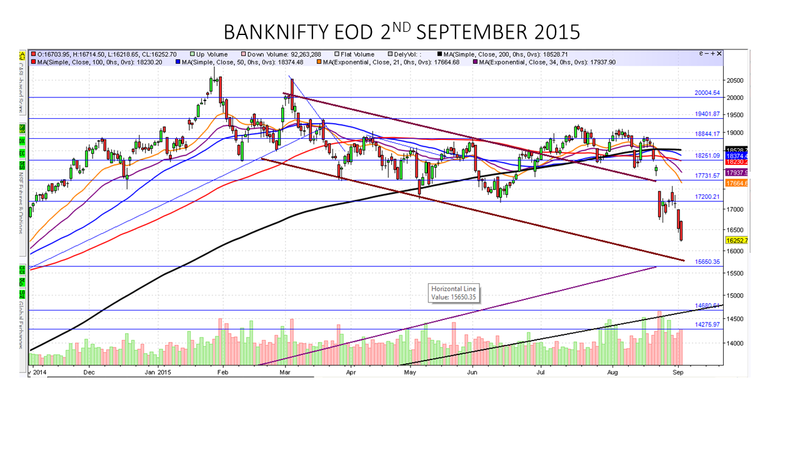 In either scenario, the risk-reward ratio is in favor of buying on delivery basis for Diwali 2015. As far as the longer term is concerned, I am reiterating the bullish stance and would like to remind readers that Nifty is poised to cross the 10k barrier over the next 3-4 years. 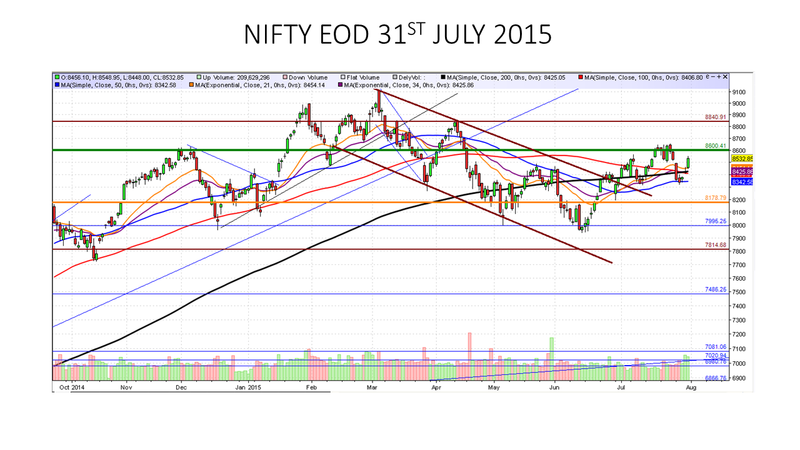 As far as trading is concerned, one should exercise caution in FnO space in current scenario. Volatility / Implied Volatility are high and even a sideways move is sufficient to reduce option prices. On the other hand, with higher IVs, even a large move may not bring substantial difference to the options. For futures, this kind of volatility can erode significant margin in case the position goes against traded direction. This is even more critical considering that soon, contracts will have new lot sizes that are higher and thereby increase risks. It is very tempting to look at the swift gains that can be made with the higher lot size, but greater the reward, greater the downside when the position goes against. Unless one is a seasoned player with tight money management rules and discipline, the current phase is not conducive for options in the Indian market. It is much better to stick to buying the dips on delivery basis. Ignore the media as their job is to fill airtime with news. The same point will be used to justify the market move. 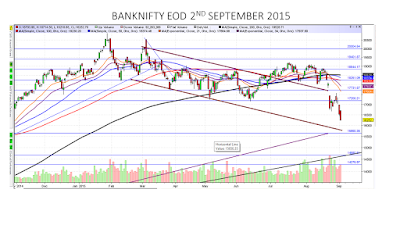 Suppose BankNifty had started the week on a positive note after reduction in base rates from HDFC Bank and the news regarding too big to fail banks on India, the justification would have been that lower rates imply economic confidence and larger loan books etc etc etc. Since banking stocks have been hammered over the last 2 days, the excuse has been that lower interest rates mean lower interest income etc etc etc. So whether the prices move up or down, the same point will be used for justifying in a different way. For fundamentals, the USD-INR exchange rate will be a critical barometer and the faster we come back to the sub-64.25 levels i.e. Rupee strengthening against the dollar, the faster will be the recovery for equities. Onion prices are going through the seasonal spike and will reverse to normalcy soon. Overall inflation numbers are ok [though I don't agree with RBI's inflation measuring metrics] The way things are moving, a rate cut is highly likely before Diwali 2015 that will fuel the relief rally. For September series, we have already got the strong moves in the beginning of the month. In a couple of sessions more, the volatility cooling effect should start with a range-bound market in between. Large moves in either direction with higher volatility will return to the market around 22nd September [Fall Equinox] and prices on 30th September will be most critical to determine underlying strength / weakness.